This new public service announcement, designed by Tanjuria Willis - an ACSS board member and volunteer, features some of our valued clients (VIPs). Whoa! That was an “Aha!” moment for me. Timothy probably speaks for so many of us when he frankly admits that he fell prey to a stereotype that all homeless people could do better, be better, if only they TRIED harder. Or, maybe they wouldn’t find themselves in this situation if they just helped themselves. But when he got to know the CareerWorks class and engaged with the people, they dispelled a myth many of us would like to believe: Homelessness is for other people. It’s not going to happen to US! The ACSS staff and volunteers don’t see stereotypes. They see strength, tenacity, motivation, dedication, intelligence and spirituality. All of the people who are attending the CareerWorks program aspire to achieve their dreams. 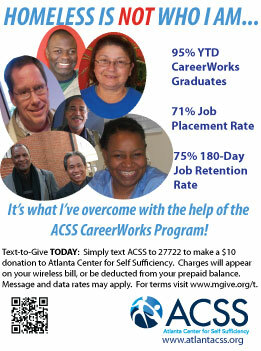 ACSS empowers those dreams every day in every job readiness class, in every job interview prep, in every graduation. Dreams are empowered. A foundation for life is laid. Timothy Wright will leave his internship with a different concept of the homeless. That is one of the greatest achievements ACSS can make: dispelling the myths and removing the stereotypes. Written by Barbara Hughes. Barbara is an ACSS volunteer and serves on our Marketing & Communications Committee. 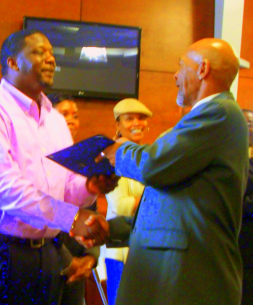 On March 2nd, ACSS held a graduation ceremony at a new venue — Atlanta Mission’s downtown facility across from Centennial Olympic Park. The ceremony was filled with excitement and high emotion… as usual. We graduated 27 VIPs in CareerWorks Class Number 17. To support our graduates, five prospective students for Class 18 were there — along with friends and family of the graduates, the ACSS Staff, ACSS student volunteers from the University of Michigan and a host of supporters from Atlanta Mission. You can read more about Brandi here. And please visit our Facebook page to see more photos of the event! CareerWorks is an intense job readiness and life skills training program that continues to offer resources and support to graduates even after they gain employment. The graduates of ACSS Class 17 are breaking the cycle of homelessness in their lives. But they could not have done it without the generous support of ACSS’ donors and volunteers. To find out how you can support future CareerWorks classes and other ACSS programs, please click here for information on volunteer opportunities and here for ways to donate. Who are the homeless? They are us. ACSS Class 17 President Brandi Bell. Meet Brandi Bell. Class President. Associates’ Degree. Pursuing bachelor’s degree at Georgia State. Florida cosmetology license. Mom to Kyle. Bright, enthusiastic, smart. And, homeless. What? How can Brandi, with all of her special gifts and talents, be living in a shelter? Brandi’s story has been told countless times, especially in the brutal economy of the past four years. The difference is that Brandi entered the CareerWorks program at Atlanta Center for Self Sufficiency a month ago and now she has a plan. I talked to Brandi after the graduation reception and asked her about her Five Year Plan, one of the cornerstones of ACSS’s employment readiness program. Brandi is a very focused and realistic woman. She knows that a dream is just an idea without a plan, and that long-term dreams get put on the back burner when the immediate priority is to find employment and affordable housing. So, her plan includes short-term actions (job, housing) and long-term goals (a bachelor’s degree in Marketing to work with a hair care line in Atlanta). Brandi would love to work right now in customer service and I could see her in that role. She is upbeat, professional and friendly. And wouldn’t we all love to hear someone like that when we call with a customer service problem! I asked Brandi what she would be doing on Monday. She had her whole week mapped out with meetings, interviews — and it will start all over again the week after, and the one after that, until she and Kyle have a home — because she is on the path to her dream. 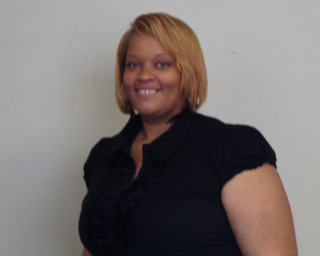 ACSS provides support for Brandi and others like her who have graduated from the program. There is abundant evidence that followup prevents individuals from falling between the cracks and losing heart in this difficult job market. All of us have needed a hand up some time in our lives. All of us have benefited from a mentor from time to time. These things have empowered our dreams and transformed them from ideas into reality. This is what has happened to Brandi Bell and her 26 classmates. This is what ACSS does every day. You can meet someone like Brandi Bell every day at ACSS. Attend a monthly graduation ceremony. Donate. Volunteer. There are so many ways to be a mentor and be that hand up in a person’s life. Meanwhile, I’ll be looking out for Brandi Bell somewhere in Atlanta, pursuing her dream. She is going places. Triathlete Bishop Leatherbury found his inspiration in the affirmation of ACSS Class 13: "Powerful Warriors, Victorious Champions!" Bishop is an ACSS board member, Southeast regional managing partner at Tatum Partners, LLC and, most recently, a successful finisher in the Ironman World Championship — a grueling triathlon in Kona, Hawaii. 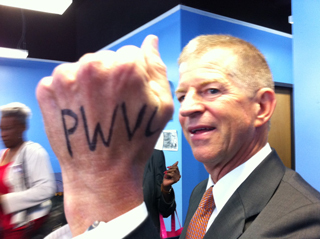 While competing, Bishop says he was inspired by an affirmation coined by members of the previous graduating class (13): “We are Powerful Warriors, Victorious Champions!” With a thick black marker, Bishop inscribed “PWVC” on his hands, which he glanced at often for encouragement throughout the long triathlon. The Ironman World Championship has a strict time limit of 17 hours. Bishop set a personal goal of 14 hours. See how he did in the video!